In 1979, during political unrest in Iran, six American diplomats narrowly escaped death by hiding out in the Canadian Embassy. For 79 days they stayed inside the house, watching the news in fear of their lives and terrified of being discovered. Several attempts were made to rescue them that all failed in the long run. But when CIA Technical Operations Officer Tony Mendez was called in to find a solution to the ongoing crisis, little did they know that the key to their freedom would be a fake sci-fi movie of epic D-level quality titled Argo. Mendez came up with a plan for each of them to pretend they were crew members scouting locations in Iran for the movie and would be back on their way to United States thereafter. Sounds bogus, but this absurd scheme actually worked, and later became known as the Canadian Caper. What's even more incredible? Ben Affleck directs this extraordinary story. No, not that Ben Affleck. Not the guy who donned a red superhero suit to play the blind hero Daredevil. Ben Affleck, the director and actor who's had one helluva second act in his career with hits like 2007's Gone Baby Gone and his even better sophomore directorial effort, 2010's The Town. The director, who plays Mendez in the movie, doesn't employ flashy drama or overly drawn scenes to tell this amazing yet sensitive story (though he could have easily fallen into that trap). Rather, the audience is taken back in time as if the events are happening in real time. He shows the vantage points from all camps at each moment--the CIA team led by Jack O'Donnell (Bryan Cranston), news organizations, the faux LA movie studio, the White House, and the massacres and strife in Tehran, Iran. Then we zero in on the six hostages (played by Clea Duvall, Tate Donovan, Rory Cochrane, Christopher Denham, Kerry Bishé, Scoot McNairy) who will steal our hearts and keep us fully invested throughout the entire movie. And even though some of us may already know the actual story, Affleck further manages to keep our hearts racing building one tense scene after the next. He also captures Mendez's serene poker face, his propensity to remain calm in a quandary, as he bravely yet carefully takes the lives of six strangers into his hands and ask them to trust him. It is that moment of hopelessness and despair seen on the faces of these wonderful actors that captures the audience and makes the struggle seem so genuine. 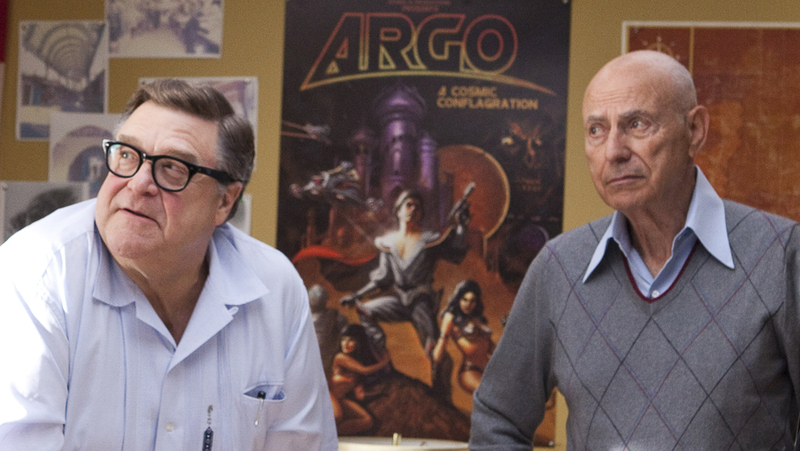 Meanwhile, back at the pseudo LA studio where Mendez has set up shop, his partners in crime Lester Siegel (Alan Arkin) and John Chambers (John Goodman) provide the lighthearted yet tender comic relief in the midst of a very serious situation. John as the B-movie special effects artist and Lester as the "producer" bicker, curse, and make fun of themselves and the industry, further enforcing the ludicrousness of the project in which they've somehow found themselves knee deep. Affleck smartly shoots their scenes like the rest of the film--in tangent with each other locations--eliciting a variety of emotions from the audience. But it is the last 30 minutes of the movie that grips the audience, keeping them white-knuckled and on the edge of their seats. When it's time for Mendez's plan to finally be acted out, the absurdity quickly dissipates as the hostages as crew members immerse themselves in their new roles out of both fear and desperation. And at the same time, the audience jumps on board with them. When they play dress up and assume new identities for an inane sci-fi movie, it starts to get real. It becomes less of an inane idea, and more about a viable way to freedom. 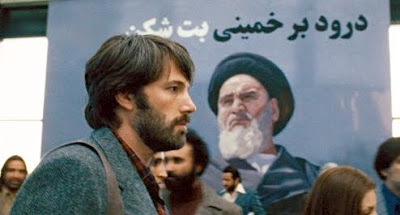 That's when Argo becomes the ultimate taut, tense thriller to which it was building up the entire hour and a half before. 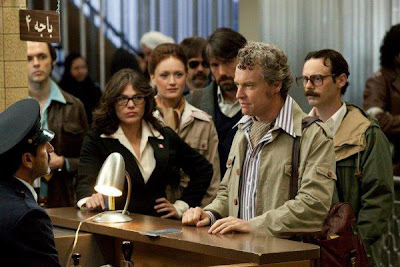 Argo is propelled by not only intense scenes and vivid reenactments of actual events that transformed a society, but by an exceptional story and screenplay by Chris Terrio (his first for a full feature film) that is nothing short of mind-blowing. Affleck continues to impress audiences with his keen eye for direction, knowing just when to fall back and allow this top-notch cast the freedom to interpret the events in a way that will most compel viewers. It comes off authentic, even at its most preposterous. And for a film like Argo, you simply can't ask for better than that. Good review Candice. It's a very good movie, that's for damn sure, but doesn't seem all that special considering the story is pretty conventional and predictable. Yeah, I didn't know the result of the story going in but by the middle, I felt like I knew where it was all going. Once again Candice I pretty much agree with your review. Excellent movie. I liked the balance of real dramatic suspense with comedy throughout until like you said "the last 30 minutes of the movie that grips the audience, keeping them white-knuckled and on the edge of their seats." THAT was so well executed and what movies are made of. Dan I think therein lies its brilliance. You kind of knew where it was going and STILL it was suspenseful. Having not known the story before I thought something may go wrong the whole time. I was prepared for anything. Wonderful reveiw! I'm seeing this on Thursday. Great review! I absolutely loved this movie too! Loved this review Candice! I agree with so much of what you wrote about this amazing movie. 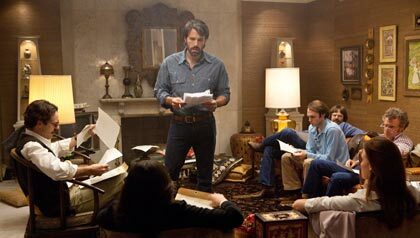 I am eager to see again and enjoy the multiple levels of greatness in ARGO. Big congrats to Affleck!